Our fridge ended up being an awesome deal (more than half off)! It gets delivered tonight… I can’t say I’ve been this excited for a kitchen appliance since we unwrapped my KitchenAid mixer the day after our wedding. We’d already done some preliminary appliance research on the other items so we have an overall Kitchen Appliance Plan in place, but recently inspiration has struck to give the kitchen a bit of a facelift. When we bought the house we didn’t do anything to the kitchen, bathrooms or basement bar since they were all in excellent shape (and weren’t having carpet put in). I like the dark cabinets and unique brick back splash and soffets, but there are definitely some things about the kitchen Brad and I want to change. I never thought I’d kick myself for not having a bunch of pictures of my kitchen. Adding this to the Look What I Got! 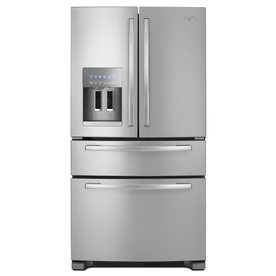 Link up… 50+ percent off a refrigerator counts as a great deal I think! Click to see other bloggers’ deals and steals. Posted on January 22, 2013, in Commentary, Home, K-couple and tagged Home, home improvement, K-Couple, kitchen, kitchen appliance, remodel. Bookmark the permalink. 12 Comments. That’s so pretty that it would like highly out of place in my kitchen. I’m still jealous though. Getting a new fridge is pretty awesome. We started the same way as you, first with the vent above the stove, then we replaced the stove, then the fridge. I’m currently eye-ing both a new dishwasher and microwave. Ours is a very slow renovation. I love your new fridge! How exciting! This is probably the best deal of the link up! Thanks for linking up! That is an awesome deal! I’m so glad I live in an apartment and I’m not responsible if the appliances break. Thanks for linking up!